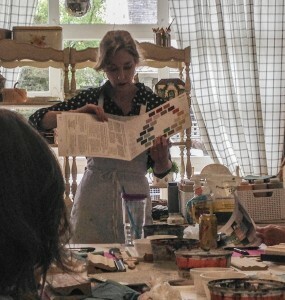 A rainy day in May is a perfect day to be at The Studio for a Chalk Paint Essentials Workshop. 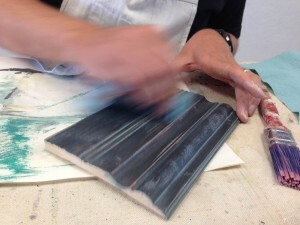 We learned four different techniques and so many tips and tricks. The damp air did effect paint drying time, but we used that as a teaching moment and know to expect a longer drying time on a damp day. One of my favorite techniques is sampled here below; we painted graphite, then used a tiny bit of bronze shimmer and a light wash of duck egg for the look of an aged metal patina. I can’t wait to see what these ladies (and Ted!) will paint next!